Over the past year and a half, I’ve made a lot of postings about our 15 Views of Orlando project (published at The Burrow Press Review, and collected into a print collection from Burrow Press). Well, there’s further good news about the collection: we’ve started franchising! Well, that sounds maybe too-corporate and too-McDonald’s. But we’ve recently tackled our second city/region, with the awesome John Henry Fleming serving as editor of 15 Views of Tampa Bay. Fifteen Tampa-area writers writing about the Tampa Bay region in one long, winding, sequential story. Some big names, too, that–if you have any interest in Florida Lit or the Bay Area–you’ll want to check out. You can read his introduction to the series here, and new installments are available weekly at The Burrow Press Review. I honestly can’t say enough about Mr. Fleming; he’s a stellar writer and a stellar editor, and it’s a true honor that he’s helped to make the 15 Views series into a true Florida institution. We’ve had some good press already, too, from the University of South Florida, and the Tampa Bay Times. Run, don’t walk, to BPR to get started reading. You won’t be disappointed. The second part of my interview/ conversation with author Lavinia Ludlow is now up at Curbside Splendor Publishing. Hope you check it out, and hope you check out Lavinia’s first novel alt.punk, or her upcoming book Single Stroke Seven. Also, Curbside Splendor’s got a great catalogue they’re building; I read Victor David Giron’s Sophomoric Philosophy (which I’d compare to Joe Meno’s Hairstyles of the Damned, except with a Mexican-American flair, if you can imagine that? ), and I’ve read a few of the stories from Michael C.’s Chicago Stories when they were published elsewhere, but I’m eager to give the full collection a whirl. Check out the interview. Support the small-press, also. They’re starting to take Chicago by storm. Full disclosure: I’ve long wanted a small-press publisher here in the city of Orlando. We’re an international destination city, a major hub for tourists and convention attendees and even for travelers throughout the state. We’ve got a world-class airport, world-class restaurants, world-class theme parks, world-class hotels, a world-class university, but here’s the problem: it’s all world-class, all intended to appeal to the mass market (and in many, cases, to be exported…Darden Restaurants, after all, is headquartered here). For many, Orlando is an artificial city crafted by corporate interests, not a distinctive cultural center. So, as a proud resident with a bit of knowledge about the history of the city and the distinctive culture that pulses in small pockets here and there throughout the metropolitan area, I take every opportunity to not only enjoy the culture that I find (from local restaurants to local bands), but also to support and share that culture with as many locals and out-of-towners as I can. I mean, seriously…do we want Orlando to be known for Red Lobster and Oliver Garden, or for Beefy King and Dexter’s?And do we want our own residents to think that this is all that we offer, and all that we’re capable of? 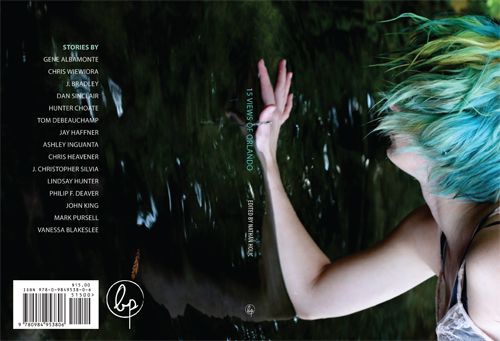 Fragmentation and Other Stories is the first release from Orlando-based small-press publisher Burrow Press, which now joins The Florida Review, The Cypress Dome, and Specs, as local literary journals/ presses. Yes, I know, this is nothing compared to Boston or Portland or Chicago or New York, where there are not only dozens of colleges and art institutes and museums but also dozens of literary magazines and small-press publishers and indie bookshops and record shops and…but you know what? I’m not writing this post to complain, but instead to praise editors/publishers Jana Waring and Ryan Rivas for having the courage and initiative to actually get this thing started. I was recently able to attend their release party for this first book, and was pretty impressed with the turn-out at the new downtown Urban Re-Think (does this indicate that there are more lovers of literature in the area than the average outsider might think?). As for the book itself: it’s a nice volume, well-constructed and attractive, and like the best new independent literary journals that I see (Artifice, Pank, etc. ), it’s highly creative in layout and isn’t content to just try to do what other journals are doing. The interior pairs photographs with stories (it’s all fiction, no poetry or drama), but the photographs were all taken with the stories themselves in mind. Flip through the book, and there are a lot of images and interesting uses of space (heavy black, or appropriate blankness) to give the overall text a more dramatic feeling. Simply put, the editors are trying to make this into something more than just another lit mag. I’m looking forward to seeing what else Burrow Press produces, but this is a nice start for a small-press publisher. I doubt that Orlando will ever be known as a major cultural hub (the Disney-stacked odds are against that one), but there are a lot of talented people in this town, many of whom do not even know that the others exist. And there’s also a strong reaction to the mass-produced plastic culture that the theme parks and chain restaurants create. Who knows? That reaction could produce some fantastic music and some fantastic literature. Burrow Press has got the ball rolling. The real test will be in their consistency/frequency of publication (they obviously can’t call it quits now! ), and in the relationships they form with area writers and musicians and artists (which, judging by the many different types of talents on display here, are starting strong). You can check out their web site here. I suggest that, if you’re an Orlando local, you support Burrow Press (and Beefy King, too, our best local restaurant). “Couch” is a bizarre little novel, the story of three young men (“slackers,” as the blurbs tell us) who become attached to a couch, then become commanded or compelled to undertake a “Lord of the Rings”-style journey whose mission is to return this couch (an ancient and magical artifact, we learn) to its rightful place, and to reset the balance of the entire world. When I picked this book off the rack, I literally couldn’t believe that (a) someone had actually committed himself to write something so strange, a Kilgore Trout idea, and (b) that a publisher had actually committed to the project, also. It felt strange to read this book, then, with no real expectations. After all, how am I supposed to know what to expect? 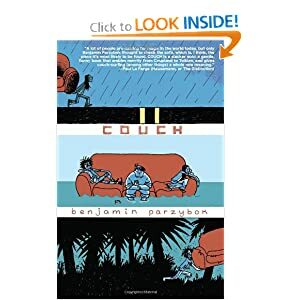 After reading, I’ll admit that I was a bit exhilarated by the experience: everything about “Couch” is just so different that other contemporary fiction. There’s an unassuming innocence here, a complete lack of pretension (there are moments in the story, as legends are discussed, that feel as if they are pulled from the pages of McCarthy’s “The Crossing,” except here they do not feel mind-numbingly dull and literary), and we move through the novel swiftly, always surprised by what comes next. “Couch,” in the end, really doesn’t offer us a whole lot. At 280 pages, it probably drags on for 80 pages too long. The characters only seem to come into focus after page 150 (before that point, they feel like sketches, and their dialogue is rarely revealing), and the action sometimes feels under-developed, never detailed or cinematic, too easy. It becomes tough to visualize what is happening, many times. And the writing style is often lazy…we see glimpses of the writer Parzybok can be, with some vivid moments scattered here and there, but too often it feels as if he just got tired, or got bored with a scene and wanted to move on quickly. We have cartoonish exclamations throughout (“? !”), and “Dude!”-style exchanges that feel pulled not from real-life, but from an undergraduate creative writing course. When it works, it works. It’s a breath of fresh air, all in all. But there’s little to make it truly memorable or important. Because of the bizarre premise (and indeed because of several passages in the book that started to make some interesting connections), I expected “Couch” to truly say something about slacker culture, about couch potatoes, about…well, anything…but in the end, the social satire feels so muted and distant that it never becomes resonant. I remember reading a couple stories from Benjamin Percy in Esquire awhile back, and each of them was haunting, the type of short story that stayed with you long after you finished reading. For my money, at least, that’s the sort of story that I love: the kind that is not easily dismissed, that kind that might seem simple or innocent or easy on the surface, but that…just…won’t…go away. So when I found Percy’s collection, Refresh, Refresh, while on a several-hour-long tour of Powell’s Bookstore in Portland, Oregon, I decided to give it a shot. Usually, though, I don’t buy very many short story collections by authors with whom I’m not too familiar; I tend to stick with The Best American Short Stories or just read the full collections of authors whose novels I’ve already conquered (or I’ll borrow the collection from a friend, take it on a test drive). Same goes for albums. The more I hear and the more I like, the better the chance that I’ll buy an album from a new artist, but I’m not the type that wanders record stores searching for something I’ve never heard. So I’ve got to tell you: I was extremely happy that I took a chance with Refresh, Refresh. The stories here are dark, many of them horror-influenced:we’ve got stories about bear attacks, stories about a potential Big Foot stalking an Oregon forest, stories about undiscovered caves expanding below ordinary residential houses, stories about post-apocalyptic landscapes…Refresh, Refresh has all the creepiness of House of Leaves, but all the sparing poetry of Cormac McCarthy and all the empathy and patience of an Andre Dubose collection. The title story seemed to be the piece that garnered Percy the most attention (it was collected in a Best American anthology, and won a Paris Review prize), but there were several others in this book that proved even more resonant, including one short story about a married couple stranded in a gas station during a hail storm. Some of the images from that story…wow. And after reading, I actually think Percy will become one of the more respected voices of Millennial/ Gen-X literature. He’s actually doing the same work as Michael Chabon, attempting to mix “genre fiction” with “literary fiction,” taking the horror genre and imbuing it with the thematic complexity of true literature. But Percy is doing it better. With Chabon, his attempts at “mystery novel” and “adventure novel” seem to be mere curiosities, side projects. With Percy, we get the sense that he’s on a mission to carve out a real place for horror literature. He’s got a novel on the shelves now (The Wilding), and another in the works, so this is definitely an author we’ll have to watch. In ten years, he might be the next Jonathan Franzen or Michael Chabon, the voice of a generation. First, I want to comment on Mansbach’s prose quality, and on the narrative itself. “Angry Black White Boy” seems to pulse with the energy of hip-hop, and it takes only a few pages before you almost start nodding your head to the rhythm of the words. I won’t claim to be a scholar of hip-hop literature, but I’m not sure I’ve ever read a book which more perfectly captures the cadence and vocabulary of Hip-Hop (and no, I’m not talking about the dialect of “Black America,” but instead the culture and attitude of the music itself). I’ve read novels which seem to exude the spirit of rock music (“Hairstyles of the Damned,” “High Fidelity”) and new wave music (“The Informers”), but never a novel that really feels like hip-hop on the page. “Angry Black White Boy” is, from a prose quality standpoint alone, a remarkable achievement. The narrative, though, is a bit rockier in quality. The novel begins slowly, allowing us to truly become immersed in the character of Macon Detornay, to see his goals, to see his daily tasks, to see how his mind works, but at perhaps the one-third marker, the book takes a strange turn: Macon is arrested, then winds up on TV, then becomes a sort of black-white prophet, calling for a “Day of Apology” and starting a “Race Traitor Project,” and then there are massive riots, etc. Essentially, this novel becomes more interested in the highly satirical plot elements (the riots, especially) than in the characters; even though it remains well-written until the very last word, the characters take a backseat to the general craziness that Mansbach has imagined (much in the same way that many summer action films allow their CGI effects to overtake the actors). The novel never fails to engage us, and we’re always interested in what comes next, but we stop caring about the characters after page 150 because…well…quite simply, the author seems to stop caring about them, seems to stop treating them like flesh-and-blood people, seems to see them more as human props amidst the special effects. By the end of the novel, when Mansbach tries to zoom back in on Macony Detornay and his (by now) wildly inconsistently characterized friend ‘Nique, I barely understand the motivations of either character; it’s a disorienting pan-in and pan-out technique that Mansbach has employed, and his frequent use of point-of-view shifts doesn’t necessarily help our emotional detachment. In short…fun to read? Yes. Highly flawed in character and plot? Without a doubt. But about that “Post-Racial America” comment I made above…this is interesting stuff. “Angry Black White Boy” presents the irony that the moment of true reconciliation between races will actually lead to greater chasms between races. Reconciliation will always be approached with some motive in mind, whether that motive is guilt (“I’m so sorry for all that we’ve done to you”) or commodification (“I support rap music…because it’s profitable.”), and forgiveness will always be a choice. Some will offer it, and some will refuse it, and some will even retaliate against it. If we say we live in a Post-Racial America, that means we’ve likely avoided reconciliation because we know that reconciliation can cause conflict. It’s as if we’ve constructed a bridge by taking some engineering shortcuts…and sooner or later, those shortcuts will lead to the demise of the bridge anyway. 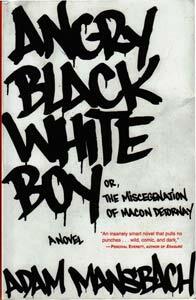 “Angry Black White Boy” is about five years old by now, and was published long before Obama’s “Post-Racial America” speeches. The book seems to illustrate our unique Millennial ability to willingly ignore problems that do not feel immediate, and the disastrous consequences of actually confronting those problems head-on. I’ve written a great deal about how the true “Great Millennial Novel” will show us characters who are striving toward some unifying noble purpose (a la the “Greatest Generation” and World War II, and the Baby Boomers and the Social Revolution of the ’60s and ’70s), and “Angry Black White Boy” gives us one imagined purpose: racial reconciliation. Do I think that this will be the cause to unite the Millennial Generation? Probably not (especially considering the collective pat-on-the-back that Millennials have given themselves for getting a black man elected to the presidency). And anyway, the horrifying effects of Macon Detornay’s pursuit of his purpose likely won’t win him any followers in Post-Racial America. Here’s a quick link to Mansbach’s author site. 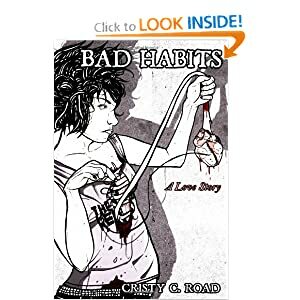 Cristy Road’s “Bad Habits: A Love Story” is truly a unique novel, a punk rock hybrid combining traditional text and illustrated comic panels. It’s quite an experience, overall, with a distinctive tone established by this strange and disturbing juxtaposition of clean prose and (sometimes) outright disgusting visuals. I’ll be honest. I’ve wanted to see a great hybrid comic/novel for a long time, and I thought Evan Kuhlman’s “Wolf Boy” was really a missed opportunity. “Bad Habits,” also, misses its opportunity to be great. It’s an idea that works, in theory, and the visuals in this book (and the sheer number of them) blow away anything we saw in “Wolf Boy,” but the prose quality simply pales in comparison. Yes, Road is great with long introspective monologues, but by the end of “Bad Habits,” I know very little about this character, about her friends, about her life. I know her voice very well, but the author relies on the images to show us everything, and so the prose is mostly abstract and intangible “telling” language, rarely building a visual. To be a complete hybrid novel, both elements–illustrations and text–need to be all that they can be, and here, Road is accomplished with her visuals, but this simply covers up the fact that the prose is lacking.